The images from Pink Floyd’s The Wall, particularly the 1982 film of that name, are haunting. “We don’t need no education. We don’t need no thought control”, chant the students in unison, faces blank, walking into the gaping maw of a meat grinder. 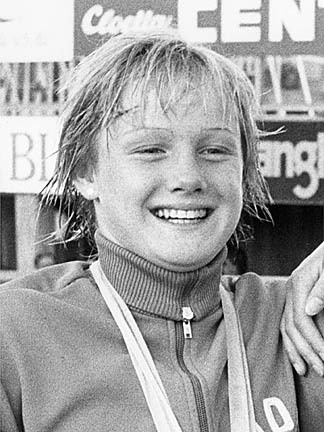 In 1977, fifteen-year old Christiane Knacke, was a promising swimmer in East Germany, the first woman to swim the 100-meter butterfly in less than a minute. Now targeted for greatness, Knacke’s coach began to put his new swimming prodigy on a new regimen, as explained the wonderful tome, The Complete Book of the Olympics, by David Wallechinsky and Jaime Loucky. At the 1980 Moscow Olympics, boycotted by over 60 nations in protest of the Soviet Union’s invasion of Afghanistan, the East Germans swept the women’s 100-meter butterfly, 18-year old Knacke taking the bronze. According to Wallechinsky and Loucky, right after her triumph in Moscow, Knacke had three operations on her elbow, her bones having turned to “crystal” due to an excessive intake of anabolic steroids. In 1998, 9 years after the fall of the Berlin Wall, Knacke was a co-plaintiff in a suit against former East German coaches who oversaw the implementation of the systematic doping. Glaser publicly apologized to Knacke, and Knacke voluntarily gave up her bronze medal. According to this PBS article, The East German Sports Performance Committee, with the blessing of Party leaders, began its systematic doping in 1974. The drug of choice was O-T, or Oral-Turinabol, an anabolic steroid created from testosterone. O-T and other anabolic steroids increase muscle mass and hasten recovery time, allowing athletes to train harder and build up more strength. And because they are similar to testosterone, they have a greater impact on women, who have less real testosterone in their bodies to begin with. Many of the girls had barely reached puberty when they began receiving the hormone pills. Their parents, too, were kept in the dark. Even more menacingly, the East German secret police, Stasi, had 3,000 moles watching scientists, coaches and athletes to make sure everyone stayed on the program. Posted in Doping, Geo-politics, Other Olympics, Pop Culture, Track and FIeld and tagged 100-meter butterfly, Berlin Wall, Christiane Knocke, doping, East German, Moscow Olympics, Oral-Turinabol, PBS, Pink Floyd, state-sponsored, steroids, testosterone, The Wall. Bookmark the permalink.